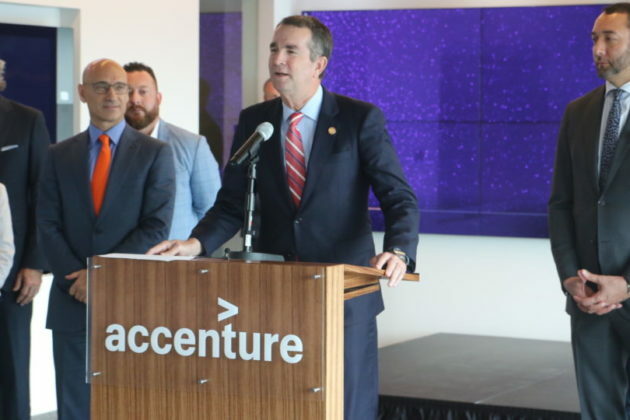 It might seem odd that the consulting firm Accenture would open a second Arlington office in Rosslyn, just a 10-minute drive from its current location in Ballston and a brief Metro ride away from its office in D.C. But company executives believe Arlington’s pool of talented tech workers is so deep that such a move makes perfect sense — and state leaders are hoping tech giants from Apple to Amazon are similarly swayed by the strength of the county’s workforce. Gov. 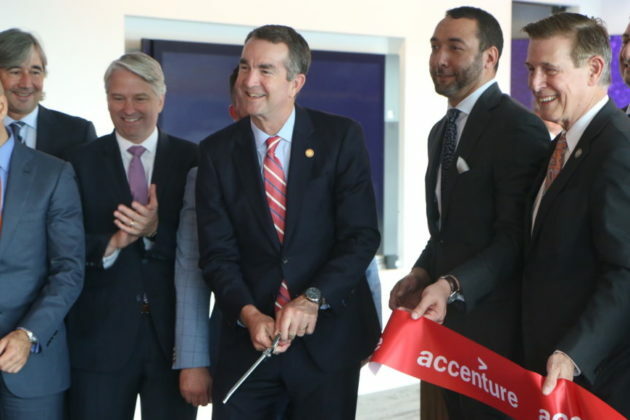 Ralph Northam (D) and Rep. Don Beyer (D-Va.) helped Accenture christen its new “cyber fusion center” inside the new CEB Tower at Central Place (1201 Wilson Blvd) today (Wednesday), hailing the company for its plans to create 1,000 high-paying tech jobs in the D.C. region by 2020. 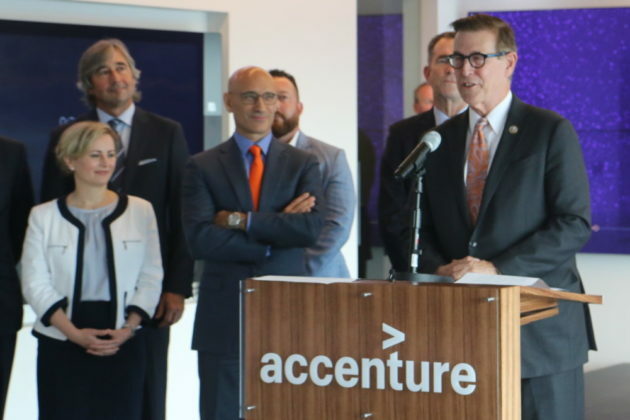 Marty Rodgers, Accenture’s metro D.C. office managing director, says the firm ultimately plans to have 4,500 employees at its Arlington locations alone, and they’ll have plenty of company. As of last year, the Bureau of Labor Statistics estimates that more than 17,000 people in Arlington work in IT-focused jobs, and Rodgers adds that 185 cybersecurity startups in the area won outside funding in 2017. Observers have speculated that those numbers are part of why Jeff Bezos and Tim Cook are eyeing Arlington so closely for expansion. Northam hopes they’re right. Northam credits his predecessor, ex-Gov. Terry McAuliffe, for putting a focus on tech training programs at both the higher education level and in K-12 schools. But it also helps that many of those workers have gained experience in the area’s bevy of federal government tech jobs, making them even more attractive to companies like Accenture that do plenty of business in D.C.
Rodgers noted that those sorts of employees will be particularly important at the company’s new Rosslyn center. It’s designed as not only a cybersecurity research hub, but also as a meeting space for Accenture to help its clients, from governments to massive corporations, investigate cyberattacks in real time. 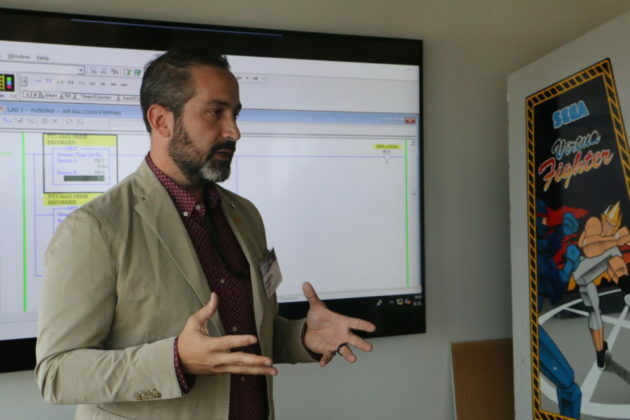 Accenture executives demonstrated for the gathered elected officials and journalists how the company might educate an oil and gas company about how to prevent a phishing attack on a refinery. After hackers tried, and failed, to blow up a Saudi Arabian refinery by breaking in to a company’s networks via a fraudulent email, company officials warned that such a scenario isn’t terribly far-fetched. Rodgers believes the center will even be innovative enough to help the D.C. region become the top global destination for cybersecurity companies. Crime Report: Serial Flasher Strikes Again?